Throughout the history of pop culture (movies, TV and comics) somebody has to be running the show... the big boss who has to be in charge... you know, the guy where the buck actually STOPS. Often times that person is a president. In some cases we get re-interpretations of real life presidents like Richard Nixon in Watchmen or Black Dynamite... and in other cases we get completely fictional leaders who fumble through life like Peter Sellers portrayal of Merkin Mufley in Dr. Strangelove. But no matter which kind of leader we get, why does it often seem as if they are completely incapable of the office that they occupy? Whether they are straight up evil (Lex Luthor anyone?) or a bumbling idiot (Dwayne Elizando Mountain Dew Herbert Camacho comes to mind) we always seem to have the wrong man for the job in charge! 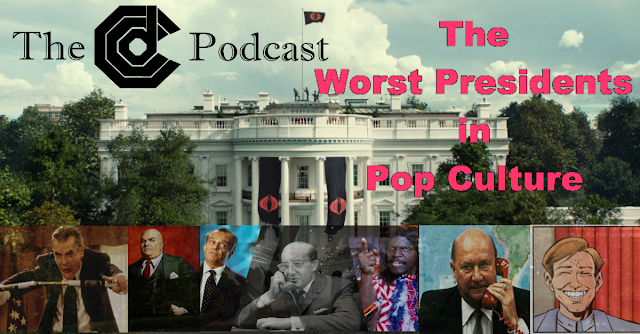 So Jedi Rob, Mike D and the lovely and talented Mrs Alicia Gomes are breaking down the history of terrible presidents in Pop Culture. Come on... this is going to be FUN!! !